At the suggestion of my friend, Sarah Szalavitz, I went to http://www.themonastery.org/ and within a few minutes become an ordained minister. 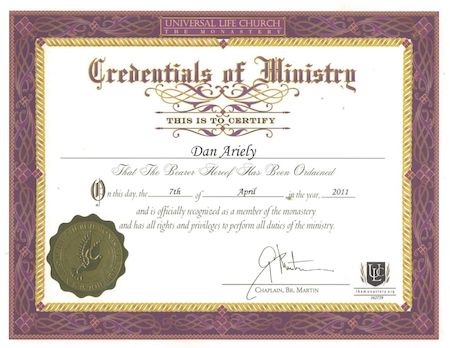 It wasn’t a deep spiritual experience, but the website tells me that in a few weeks I will get a certificate that will allow me to officiate weddings, baptisms, funerals, and blessings. Apparently I will also be able to start my own religion and perhaps most exciting — to absolve people of their sins. From all of these possible directions and options, I think I would like to start small – baby steps – and maybe try my hand at a wedding or two. My only question is what an irrational wedding ceremony would be like. Should I give a speech about all the irrational aspects of getting married? Should I point to the challenges of living together for prolonged periods of time? What about the irrationalities of having kids? Or should I take a more optimistic approach and while pointing to the challenges also suggests ways to overcome some of them? As you can see, I am open to suggestions.